The first ever Pakistani fine dining restaurant in the commune of Al Barsha, Dubai is Wrap & Roll Haandi Restaurant, which was established by a Pakistani couple back in 1997. After they failed to find a restaurant that could satisfy their craving for authentic Pakistani food. This led the couple to bring together a team of talented chefs, who can produce home-made style of food that can win the hearts of loving inhabitants of Dubai. These chefs of Wrap & Roll Haandi Restaurant used centuries old recipes and finest ingredients to prepare food that was once served from Mughals to royal families to beloved mothers. Now you can relish these lip smacking dishes at Wrap & Roll Haandi Restaurant where artistic chefs are now using these secret recipes. This fine dining bistro serves mouth-watering delicacies of Pakistan such as karhais, haandis, bbq and lot more that will sizzle your taste buds with their freshness, scrumptious flavours and aroma of herbs. This majestic art is created by a talented team of chefs at this restaurant who are the real artists behind this cookery. Aside from a la carte menu, this restaurant also offer desi brunch buffet under its ‘Specials’ category in which guests can savor combo of various meals at very affordable rates. Moreover, this bistro gives 15 percent discount to its customers, who use Barclay’s cards to buy food from this venue. Aside from serving fresh and delicious food of Pakistan in their dining lounge, Wrap & Roll Haandi Restaurant also delivers their authentic flavor food to the private places as well. In addition, they can also deliver the same great scrumptious food for the private functions and events organised by people, as this restaurant also provides catering services. See the full menu of Wrap & Roll Haandi Restaurant from here. Desi brunch buffet of Wrap & Roll Haandi Restaurant begins at 10:00 am and lasts till 3:00 pm on Fridays and Public Holidays. During weekdays this restaurant remains open till 1:00 am and on weekends its operations last till 3:00 am. Summer Land Building, Behind Lulu Super Market, Near Mall of Emirates, Al Barsha 1, Dubai, United Arab Emirates. Mall of the Emirates Metro Station 1 is 1.3 kilometres away from the Wrap & Roll Haandi Restaurant, so pedestrians have to walk for about 16 minutes to cover this distance between the two sites. All they need to do is to head in the southeast course, then turn right and afterwards make a sharp left turn towards Halim Street in order to continue straight onto Halim Street. After that walkers should turn left and later make a right turn to find the destination on the left side. 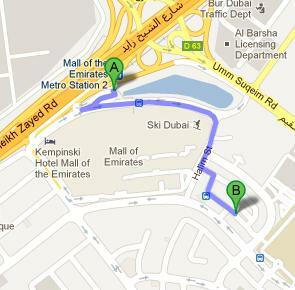 Al Barsha A 1 – Dubai bus stop is 130 meters away from Wrap & Roll Haandi Restaurant. This makes it a 2 minutes walking journey during which bus user needs to head in the northwest direction from this bus stop and then turn right. After that bus user needs to make another right turn in order to reach the destination that is located on the left side. Bus numbers 93 and F30 serve Al Barsha A 1 – Dubai bus stop. View map for directions.